Real Madrid return from a successful FIFA Club World Cup campaign to face La Liga leaders Barcelona in the first El Clasico of the 2017/18 La Liga season. Who wil win? 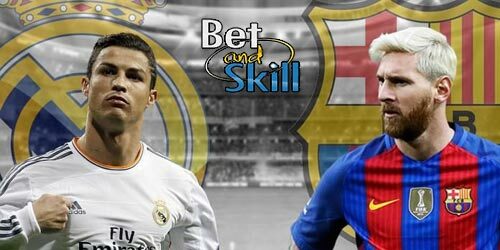 This article contains our Real Madrid vs Barcelona betting preview with predictions, betting tips, enhanced odds, probable lineups, live stream, bookie free bets and no deposit bonuses on El Clasico! Real Madrid are already 11 points behind Barcelona in the race for La Liga title, albeit with a game-in-hand. They have dropped points in no less than six games so far this season and Valencia (2-2), Levante (1-1) and Real Betis (0-1) all left the Bernabeu with some reward earlier in the season. They eased the pressure by lifting the Club World Cup for the third time in four years. The Blancos managed to beat Al Jazira 2-1 in the semifinal and recorded a 1-0 success over Gremio in the final. Zinedine Zidane will be hoping his side can rekindle some of the magic they showed during the Spanish Super Cup in August when they outplayed Barca both home and away to record a 5-1 aggregate win. Zinedine Zidane doesn't have any fresh injury concerns heading into the Clasico. Casemiro and Sergio Ramos have served their respective suspension and will feature from the off. Isco is likely to retain his berth behind the offensive duo Cristiano Ronaldo and Karim Benzema, meaning that Gareth Bale will start on bench one more time. Toni Kroos and Luka Modric will retain their starting berth in midfield while Marcelo and Dani Carvajal will start as full backs. Barcelona comfortably top La Liga standings having dropped just six points in 16 matches in this competition. The Blaugrana are unbeaten in 24 matches in all competitions since being humbled by Real at the start of the season. The Catalans have rattled in 42 goals while conceding just seven. They have also kept three straight clean-sheet against Sporting Lisbon, Villarreal and Deportivo. Anyway Ernesto Valverde's men have struggled at times on the road this season and have had to settle for a draw at Atletico Madrid, Valencia and Juventus recently. As to direct matches, Barcelona have won three of their last four La Liga matches at the Bernabeu and have averaged three goals per game across their last four league visits to Real Madrid. Thomas Vermaelen will continue at centre-back as Samuel Umtiti is out through injury and Javier Mascherano is expected to move to China in the next transfer window. Gerard Deulofeu and Paco Alcacer both miss out through injury, while Ousmane Dembele, Rafinha and Arda Turan are back in training after lay-offs but are not expected to be ready in time. Up front, Paulinho will be tucked behind the front duo Leo Messi and Luis Suarez. In defense, Sergi Roberto should be preferred to Nelson Semedo at right-back. The following are the best free bets selected for you by the BetAndSkill team. Choose your favourite offer, click the 'Claim' button and enjoy your betting bonus in few simple steps! New Customers only. Up to £100* in Bet Credits. Sign up, deposit £5* or more to your account and bet365 will match your qualifying deposit in Bet Credits when you place qualifying bets to the same value and they are settled. Min odds/bet and payment method exclusions apply. Returns exclude Bet Credits stake. T&Cs, time limits & exclusions apply. Only available to new customers from UK & Northern Ireland. You must stake £10 or more at single/cumulative odds of Evens (2.0) or greater on your first bet. Free bet balance of £30 credited within 48 hours of your first bet being settled. Free Bets expire after 7 days. E-Wallet restrictions apply. Minimum 5 game rounds. Game restrictions apply. Maximum 30 Free Spins on selected games. Free Spins expire after 7 days. Full T&Cs apply. New customers only, receive a free bet up to the value of your first qualifying bet. Minimum stake €5, minimum odds 1/5 (1.2). If your first bet is an accumulator, at least one selection must meet the min odds requirement. Qualifying bet must be placed in first 30 days of account opening. Offer is only available to customers who deposit using Debit/Credit or Paypal. Max free bet €50 – valid for 7 days. T&s apply. New Customers; Min. deposit £15 (no Skrill/Neteller); Bonus amount is 50% of deposit up to £100; 6x deposit and bonus turnover (min. 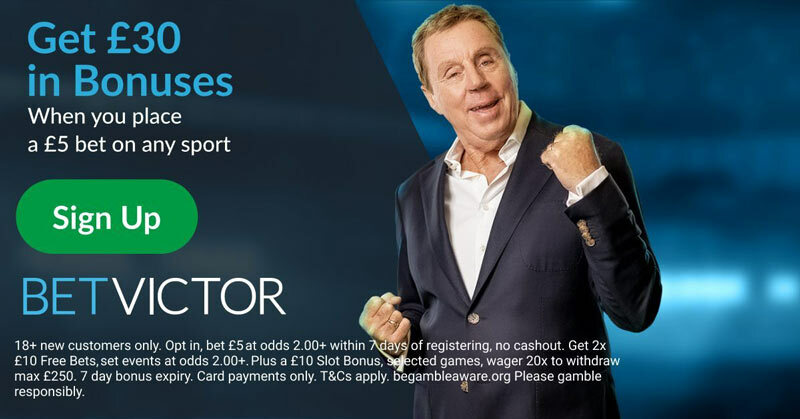 odds 3/5 on singles and 2/5 per selection on acca bets), in 30 days, for bonus release; Some bet types don’t contribute to turnover; Withdrawal before turnover results in bonus cancellation; Terms apply; 18+. New customers only. Min qualifying bet £10. 100% Free Bet credited to Free Bet Balance upon a successful deposit. To activate the Free Bet a customer MUST place bets totalling the value of their 1st deposit (up to £30). Min odds 3/4 (single), 2/5 (EW), 2/5 (system bets) or greater. 1x Wagering. Free Bet expires after 7 days. Offer is only available to customers who deposit using Debit/Credit or Paypal. 18+.begambleaware.org. T&Cs Apply. T&Cs apply. 18+. Gamble responsibly. Min deposit £20 (no Skrill/Neteller), cashback capped ad £20. Max bet £100. Only valid on sports betting with min odds 1.75 (3/4). Must wager £400 for full cashback. T&Cs apply. 18+. Please bet responsibly. Bet £10+ at odds 1.50+, get 2 x £15 free bets, 7 day expiry, credited after first bet settles. Opt in, 1 x new customer. Bet type, Free Bet restrictions and T&C’s Apply. 100% bonus up to €/£100. Exclusive! 18+ begambleaware.org. Please bet responsibly. 18+. New customers. Min deposit & cumulative bet amount £20. Min odds 2.0. Free Bet credited upon full settlement of bets, may only bet used on event with min odds of 2.0 and in single transactions. Winnings added as withdrawable funds. Free bet stake not returned. Bonuses expire after 90 days. 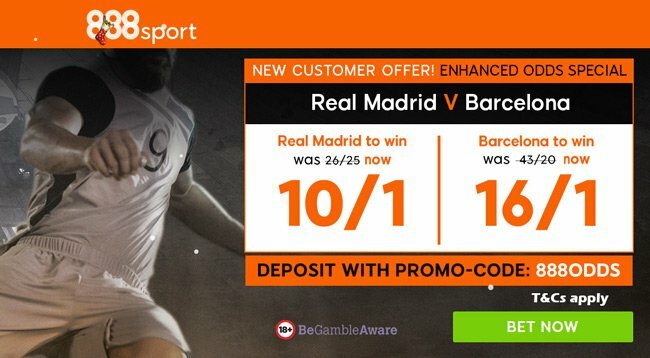 "Real Madrid vs Barcelona betting tips, predictions, lineups and live stream (El Clasico - La Liga - 23.12.2017)"
+ many other betting promotions! BetBull will match your first £20 bet with a £20 free bet! 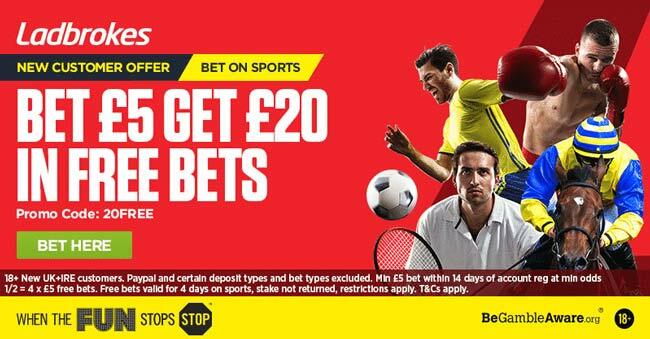 Deposit and Bet £5 to receive £20 in Free Sports Bets! + £10 in Free Casino Bonus!